Videogaming with your friends in the living room has never been so good. When the Nintendo Switch was released, the detachable controllers meant that two player multiplayer gaming was ready out of the box. Buy a second set and now you have controllers for four. True multiplayer games were slow to start, but soon after Mario Kart was released a flood of indie titles were ported over or released onto the console. While cramming four people around a single Switch display may be asking too much, but the system is portable enough to carry over to a friend’s house for some fine multiplayer gaming. As a fan of 4PLG (four player local gaming) on a single system, I’ve kept my eye open for good quality multiplayer titles and I thought I’d share them here with you. Some are big-name indie titles ported over to the Switch while others are far less famous. There are many quality options out there, so consider this the beginning of what may be an ongoing series. Each of the following games allow four player local play on the same screen and (unless noted) can be played with just four JoyCons. 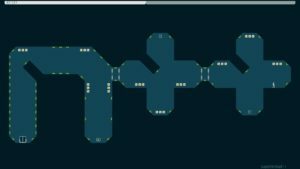 Ported to almost every platform in existence, N++ is an excellent minimalist platforming game. Players try to get through levels, activating doors, etc… in order to escape to the next level. The characters are somewhat “floaty” allowing for big jumps and they can even cling to walls (and slowly wall-jump their way up the side.) Multiplayer play is a featured part of the game. Levels typically contain mined spots which activate after a player passes through them. This can make things hard for the other players, but also can create situations where a player must travel through a mine to activate a door, but is then permanently trapped. 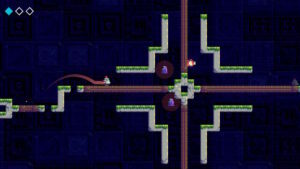 Only one player is needed to reach the door so most levels are set up for one player to move themselves into a place of no return in order for the other player to exit. One of my favorite levels is where one player is in a small room, dodging seeking missiles while waiting for the other player to unlock the door. Most (possibly all) levels can be solved with two players, so when playing with 3 or 4 players it is almost like having an extra life. This makes it great for playing with kids as two decent players can carry the game, although there are the occasional times where “extra” players end up arming mines in inconvenient locations. Highly recommended. 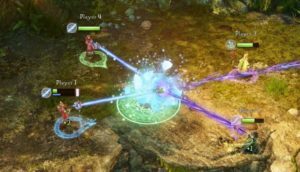 Nine Parchments (reviewed on GamerDad here) is a dungeon crawl with up to four players reminiscent of Gauntlet or Diablo where each player is a wizard specializing in a different type of magic. 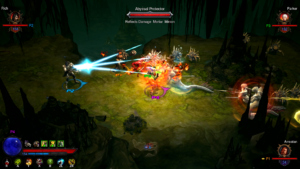 Players defend themselves against waves of enemies as they progress through 32 different levels. One of its distinctive elements is the common problem of friendly fire. Players who are indiscriminately trigger happy will soon earn the ire of their friends. While this can’t be turned off, the game can be set up for friendly fire is warped back onto the casting player instead. Nine Parchments stands out as a very substantial indie game. There are eight different wizards, each with a different specialty and their own ability trees which can be leveled up through 60 levels. In addition to local 4 player play, the online matchmaking works well even for pickup groups. Highly recommended. If you’re looking for a unique co-op experience, look no further (note, it is another title ported to almost every console system.) You and your friends are floating through levels in your spaceship trying to gather “hearts” while avoiding attacking enemies. The catch here lies in your spaceship. It is fairly large and has many different systems: engines, shields, navigation, weapons on each of the four sides, and a special attack. To get any of the systems to work, you have to actually run your character around the inside of the ship (through ladders and catwalks) to get to the controls for that system. Shooting left and want to shoot right? You have to run across the ship to the other side. 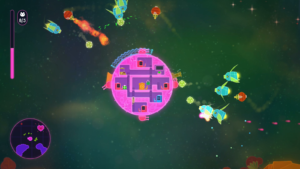 While the aliens are not as tough as one would find in a typical arcade shooter, trying to manage the multiple systems all at the same time can make things hectic enough. While more exciting, playing with less than four players is harder as you have even fewer people available to run the systems. With only two players the game is quite hard, but three players seem to be doable. Highly recommended – if you enjoy unique experiences. 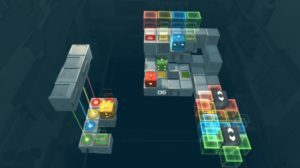 Death Squared (reviewed on GamerDad here) is a puzzle game played by four colored boxes on floating platforms. The boxes must be maneuvered to their respectively colored home spaces to advance to the next level. Boxes must tread carefully because they can easily fall off if they too far off the edge. Levels get complex as some spaces activate movement in other areas, changing the path or setting off traps. In later levels you are even placing one box on top of another and using the lower box to deliver the upper box somewhere else on the board. There is no time limit, so the game is a more cautiously coordinated game rather than a fast moving action game. Note, I also find playing with two players quite entertaining as each player controls two boxes – one with each joystick. Alternating between two boxes at the same time requires even more concentration. Good fun in a less hectic game. Recommended. Sometimes the simplest games have a surprising depth. Super One More Jump is a sort of runner/platform hybrid. You are a single white box sliding along a platform at a constant speed. At first you simply jump over objects as they appear, but things quickly get complicated. A jump at the end of a platform will result in the box “orbiting” around the end such that the cube is now on the bottom of the platform, going back the other way. 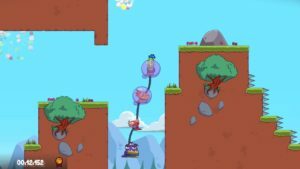 Jumping up when there is a platform directly above with latch the box onto the bottom of that platform – which could result in an entire run where you are simply hopping up and down to avoid obstacles. Cooperative multiplayer modes are similar to the base game, but players are assigned their own color. 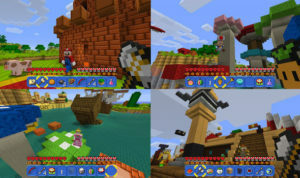 Each platform is colored and players control the box when it is on a platform of their color. Thus, players have to be ready to “take over” the controls (with their own JoyCon, of course) when the box jumps onto their color. There is also a solid competitive mode, where all players play through the same level, trying to get as far as possible before the timer runs out. Players earn points for movement so the final score is not simply who made it the farthest. While not as “deep” as some of the other games here, it still provides a solid good time. Recommended. Mercenary Kings (reviewed here) is a platform shooter where players have characters armed with guns and run around (and up and down ladders) while shooting any enemies encountered. The game is played on somewhat large levels, so each player has their own split screen while they wander around. The game has more depth than a simple shooter as completion of a level awards money to use in upgrading one’s character. This is combined with a system of resources that are gathered when exploring the levels. With enough cash and resources players can customize their character with items, weapons, and armor. At any one time, players have a choice of missions available (such as kill X things, rescue someone, or collect X resources) and they can be repeated to earn more cash and/or resources. At least one of the missions available will typically advance the storyline. One side note, I found the game does have a bit of a learning curve as many of the upgrades (such as weapons) are not available at first so you are required to complete at least one rescue level without many character improvements before upgrading can occur in earnest. A fun shooter, with some nice overarching depth through the ongoing character upgrades. Recommended. The game against all action RPGs are measured is Diablo. Making its way to the Switch, Diablo 3: Eternal collection has all the bonus material that has been released on other platforms. (Warning! Diablo is a fairly mature franchise which contains a fair bit of death, some – adjustable levels of – gore, and quite a bit of demonic backstory. You are killing demons most of the time….) As characters in Diablo advance in level they gain access to new and more abilities. Rather than a skill tree, each class (there are 7) has a set of attacks that can be assigned to a particular button. As players advance in level, they gain access to different options (and modifiers to those options) that can be swapped in. The various options allow some diversity in playing styles, but the greatest increase in character power comes from the weapons, items, and armor collected from eliminated enemies. Players can advance through the main storyline of the game, or play in a special “adventure mode” with dismisses entirely with the story and lets players hop directly into game areas in order to complete mini quests (like kill a boss or a number of enemies.) This is great for players who have already played through the story in another version. (The story is rather dark and demonic, but still good – if a bit too similar to the stories in the previous games.) Another option for players is to open up a “rift” where you enter and then kill a bunch of enemies to spawn in a big boss fight at the end. There’s also a “season” option for the adventure game where you choose a specific character and see how far you can get with that during a season to unlock special (typically cosmetic) bonuses. After the season the character is simply transferred to your “regular” stable of heroes. Online multiplayer is a fine option for getting together with friends (or enemies) but 4 player gameplay is also possible on the same screen (and players can even play using a single JoyCon.) Same-screen play works fine, but does cause problems when players want to spend time customizing their characters – changing up items or selecting abilities. Managing your character triggers a full screen mode so everyone else has to wait until that is finished. Highly recommended (for mature players) when playing solo adventure mode, a more reserved recommendation for local multiplayer. Yes, there’s also a version of Minecraft on the Switch. It even goes up to a four player split screen. It has all the expected Minecraft stuff, including some fun game modes. Multiplayer play does have one big drawback. Since the interface is rather complex, players need a pair of JoyCons (or a Pro controller) in order to play. Since few people will have that many JoyCons (or controllers,) 4 player Minecraft will be somewhat of a rarity. If you haven’t tried Flat Heroes yet, you owe it to yourself to check out the demo. We didn’t expect much but it’s so compelling we bought it right away. Even more minimalist than the “simple” titles here, but every level adds a little complexity. My kids love it, and the best part is that adding more players doesn’t increase the challenge, since only one player has to survive a level to win. I also recommend Heavy Burger. My review of it will be up next week!